This is one sidekick who definitely comes in handy! Your R2-D2 Interactive Astromech Droid figure is packed with all kinds of features to help you fight the dark side—or just have fun throughout your day. This exciting little friend rolls, spins “dances” and plays music, “remembers” and reacts to famous Star Wars characters, guards your room, plays multiple games and can even find and follow you! And with awesome features like an illuminating light beam, infrared location sensors, an adaptable droid mood status indicator, a rotating dome, motorized indoor-terrain treads, a beverage holder and manipulator arm and special “secret” features, this figure is sure to keep the fun going for “light years”!Collectors young and old will appreciate the details of this Star Wars Interactive Electronic R2-D2 Astromech Droid. Complete with movie-accurate messages and flashing lights, this droid responds to voice commands and has a special arm designed to keep your beverage handy. This friendly robot is designed to be a fun companion for kids aged eight and up. Celebrate Star Wars 30th Anniversary by inviting this movie-accurate droid into your life. Once the loyal companion to Queen Amdala, this utility droid is programmed to be your devoted helper and friend. Help him get ready to serve you by snapping his steering legs into place and attaching the projector piece to his domed top. You’ll need to use a Phillips screwdriver to insert four “AA” batteries and four “D” cell batteries in his side. 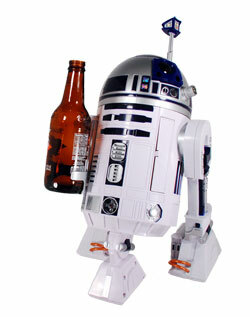 More than 15-inches tall, this sophisticated R2-D2 model boasts a secret cargo compartment, a unique swing-down utility arm that’s also a beverage holder, a removable sensor scope, a working light beam, sound-processing microphones, and an adaptable droid mood-status indicator. Sonar navigational technology and infrared location sensors help make him one the most advanced droids around. Intergalactic missions will be more fun with a reliable droid at your side. In companion mode, R2-D2 responds to commands like “Go on patrol,” “Light Beam,” and “Play Message.” Star Wars fans are sure to appreciate the accuracy of the messages, which are culled from famous missions he remembers. 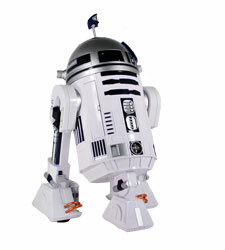 In game mode, R2 responds to more complicated commands. He’ll act as a sentry to protect your important stuff, dance to cantina music, spin around, or play light tag. The third mode is the most complex. 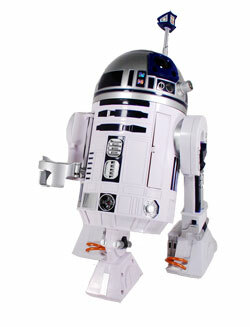 This command mode lets you give pointed directions that control R2’s movements. Tell him to turn left and right or go forward whenever you want, or set a preprogrammed course for him to follow. While R2 responded to simple commands with no problems, we had difficulty getting him to respond reliably to more complex requests. We trust that, like with any voice-operated electronic system, over time it will get easier to produce a wider range of commands that R2 consistently responds to. Until then, his movie-accurate look, the way he responds to simple commands, and the convenient beverage holder make him a fun comrade. Droid body, two steering legs, projector piece, telescope piece with sensory array, and an operation manual. R2-D2 can respond to commands. View larger. And can double has a beverage holder. View larger. This entry was posted in RC and tagged 12.1, 12.8, 17.9, Astromech, Droid, Inch, Interactive, R2D2, Star, Wars. Bookmark the permalink.